Dear Me ~ Poem #DearMe | Ms Moem | Poems. Life. Etc. to show what lies within. when times seem bleak or tough. from making her mark on the world. And make the most of your words. Find time to listen to others. Each one of us can be heard. for in fear no freedom’s found. But keep your feet on the ground. that you are free to choose yourself. To walk your path, there’s no-one else. You need to walk alone. Forget the past, resistance melts. It’s not a game, no cards were dealt. Then you’ll see you have grown. that there are those who love you so. Remember that if you feel low. that good things come to those who try. let life pass you by. 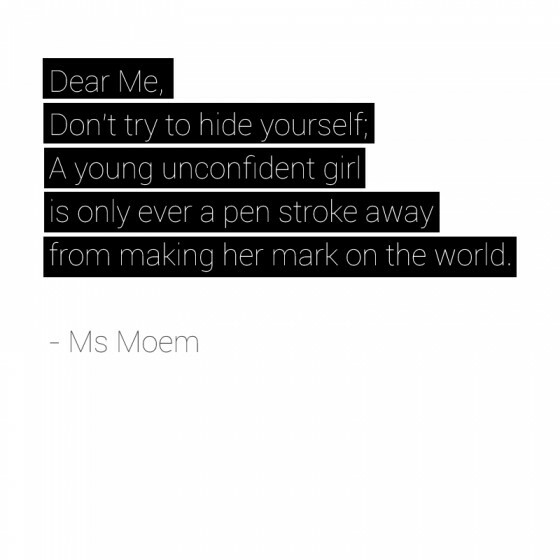 Dear Me poem is written by Ms Moem.